Legend has it that a couple of thrill-seekers named Jack and Jill started the whole hillclimb thing. Unfortunately, there’s no record of what they were driving. And that injury to Jack’s crown? It wouldn’t have happened if he’d been wearing a helmet. We do know that ever since–despite Jack’s mishap–enthusiasts all over the globe have been flinging themselves uphill as fast as they dare, piloting anything on wheels. These days they wear approved safety gear, of course. In the U.S., where topography allows, they charge up mountains ranging from Pikes Peak, the granddaddy of them all, to less-famous venues all over the continent. 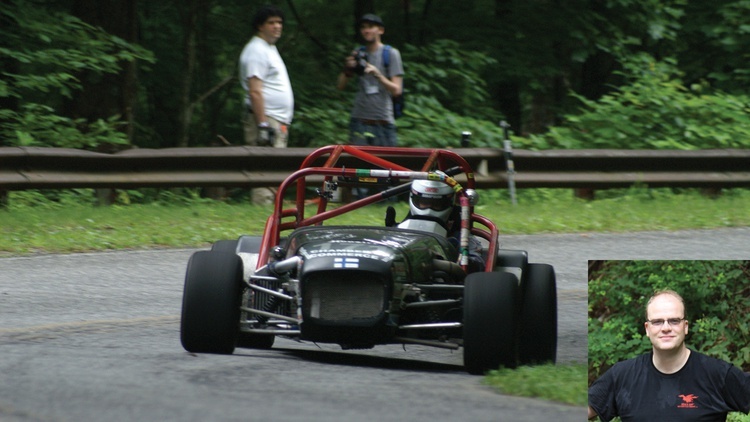 A threatened species 20 years ago, organized hillclimbs are clawing their way back, with new venues popping up and new enthusiasts joining the action. The Eastern U.S. has a long tradition of hillclimbs, from Vermont to the Carolinas. A standout event is Chasing the Dragon, held twice a year near Robbinsville, NC. This venue opened to competition in 2011, featuring several switchbacks and a handful of whoops. It’s located west of Tail of the Dragon, the worldfamous stretch of U.S. 129 that goes all corkscrewy–318 curves in 11 miles–as it crosses Deals Gap into Tennessee. Considered by many to be one of the top driving roads on the planet, the Dragon is a bucketlist destination for a revved-up parade of motorcyclists and sports car drivers who flock there every year. With all the curvy roads winding up nearby hills, why not a hillclimb? That’s the question Ted Theodore answered some five years ago. 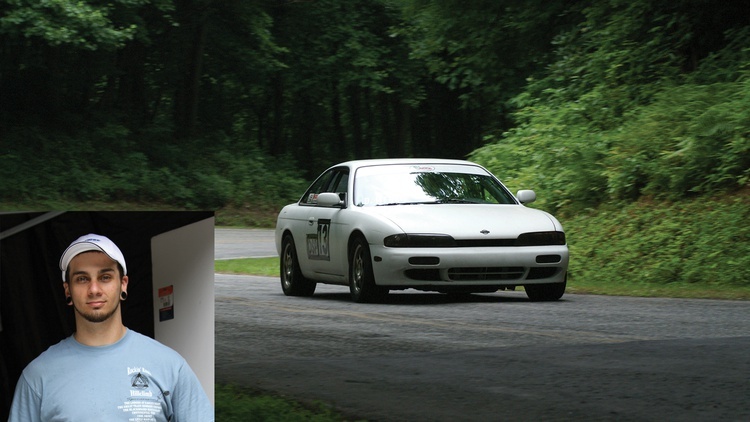 Ted, a longtime SCCA enthusiast, motorsports competition veteran and member of the Central Carolinas Region Board of Directors, loves hillclimbs. “There is nothing like a hillclimb,” he says. “It’s a blend of the natural beauty of the forest, a curvy mountain road with lots of elevation, and social fellowship–along with a dozen or more 2-minute adrenalin bursts up the mountain.” Naturally, with a pitch like this, Ted is also CCR hillclimb manager. 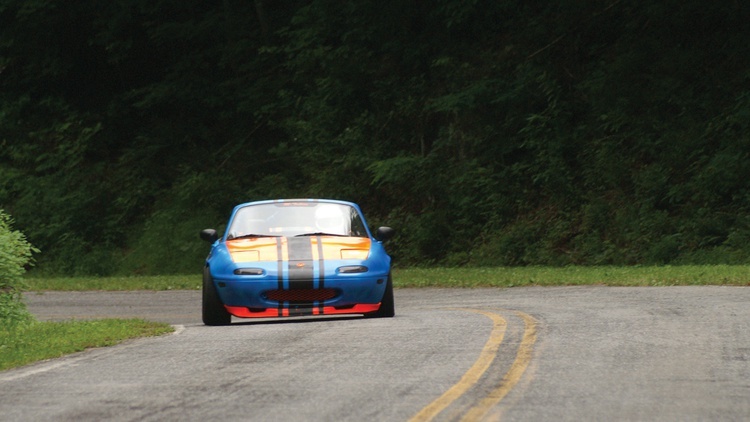 A chance meeting between SCCA racer Marc Osgood and Darryl Cannon of killboy.com–his photographers shoot the Dragon parade–led to talk of a potential location, a twisty, dead-end, two-lane blacktop that climbs to a lookout point in the Joyce Kilmer Memorial Forest. When Ted, with some trepidation, approached Graham County community leaders with the idea, he was overwhelmed with unexpected hospitality and support, as Graham County and Robbinsville saw this event as a much-needed boost to their struggling economy. With help from the North Carolina DOT, U.S. Forest Service, Graham County Sheriff ’s Department, EMS and Rescue Service, County Transit, and the N.C. Highway Patrol, Chasing the Dragon quickly became a reality. Turns out it does take a village to raise a hillclimb. The new venue proved itself right out of the box. In the five hillclimbs held thus far, the lure of the Dragon has drawn as many as 75 drivers and 3000 spectators to a single event. Competitors understand–until the red mist descends–that hillclimbs bring increased risk. While this road is relatively safe, lined with earthen walls and guardrails, bouncing off either will cause damage. The Dragon course is long at 2.2 miles, and it’s fast. Top drivers in top cars average close to 70 mph for the hill–from a standing start–and touch 110 mph in fast sections. 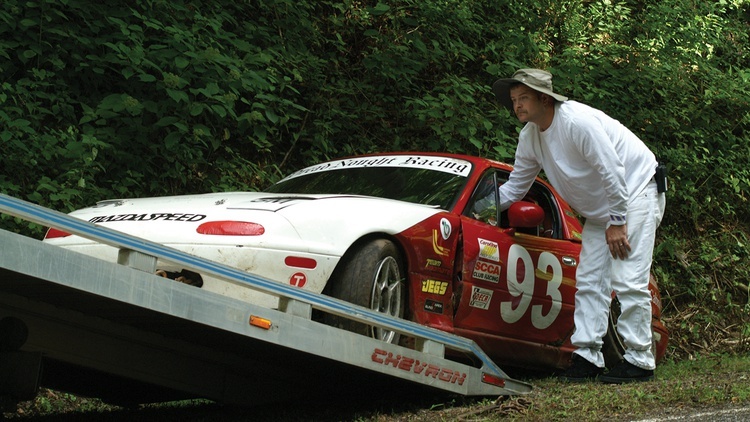 Organizing a hillclimb is an exercise in risk management that involves a complex network of insurance coverage, communications, EMS, wrecker service, course workers, novice driver training, and a host of behindthe- scenes support. Running an event in a national forest adds another layer or two of administration. To get a sample of the 50-plus drivers who ran Chasing the Dragon V, we tracked four competitors–ranging from a first-timer to a repeat King of the Hill–who wheeled rides from nearly stock to full-on modified. They told us this hillclimb offers more than the obvious thrills; they also enjoyed the friendly, helpful and laid-back atmosphere of the Dragon “family.” As for the rush, several competitors told us that after hurtling up a mountain, an autocross leaves them feeling, well, flat. Marvin Fordham, a novice from Clayton, North Carolina, ran the hill with his nearly stock Triumph TR8, a car that’s still recovering from a 12-year nap. While new to hills, Marvin’s been driving sports cars for 40 years–everything from a TR6 to a new MINI. He started in the Atlanta Triumph Club, rallying, autocrossing and working courses. Then he became active in SCCA, working in flagging and communications and as a crewmember. But as often happens, life intervened, and he took a long hiatus from motorsports. In 2010, a new MINI revived his interest. 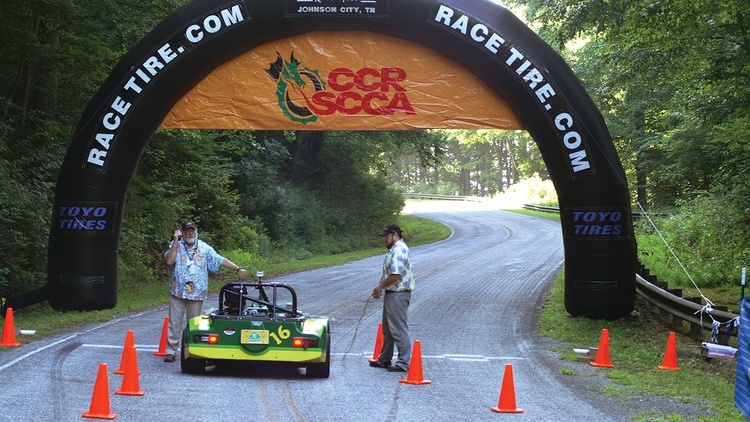 He came to the inaugural Chasing the Dragon Hillclimb as a spectator and loved what he saw. So he dragged his TR8 out of the garage and took it to a local shop. When progress lagged, he and longtime friend Bill Hightower took over the work. With an intense, last-minute thrash, they got the car ready for Dragon V, including adding a roll bar and safety equipment. Despite sorting through problems with overheating and excessive suspension travel (which caused tire rubbing), Marvin managed eight runs in B Street Prepared with a best time of 1:54.6. He sees hillclimbing as the next step up from autocrossing, yet not as intense or expensive as wheelto- wheel racing. Was it worth all the effort? “You bet,” he says. “I was very pleased with my first hillclimb. I learned a lot about the car and about my abilities.” He says he’ll be back. “Next steps are suspension work and brake upgrades.” He has no plans for immediate engine upgrades. “I have much to learn before I take that step,” he explains. Kathryn Karns lives near Clemson, South Carolina, where she’s a senior at Clemson University. Kathryn grew up riding horses, but once in college, she switched to wheeled horsepower. 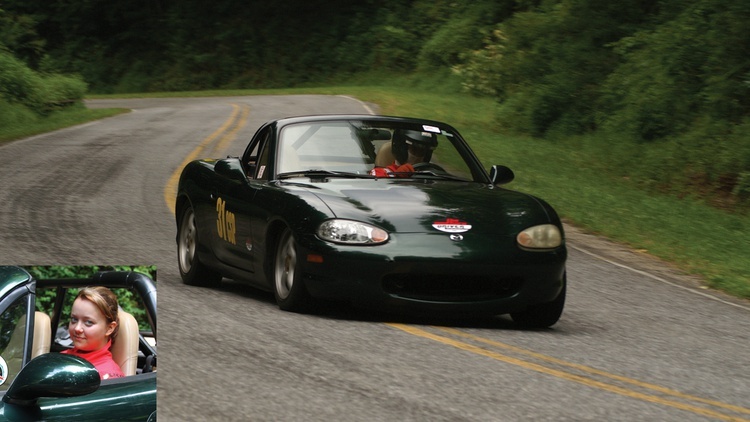 Kathryn joined the Clemson Sports Car Club and started running in their autocross program. She loved the competition and wanted more, graduating to SCCA Time Trials and then to hillclimbs. Kathryn is also a regular at a Charlotte indoor karting track, where she once competed in a 24-hour enduro. Her daily driver is a Mazdaspeed3. In SCCA events she drives a 1999 Miata: stock engine, upgraded suspension, and the required roll bar, safety harness and fire bottle. In this event she was classified in C Street Prepared, the largest class with more than a dozen entrants. Over the two days, she made 12 runs, notching a best time of 1:39.47, which put her about mid-pack. Dustin Webb, who lives in Monroe, North Carolina, started racing with karts and dirt bikes. Soon he graduated to autocross and then to time trials. A while back, he bought a wrecked 1995 Nissan 240SX for parts–his daily driver is also a 240SX. When he discovered that the wrecked car could be saved, he–along with cousin and fellow time trial driver Robert McManus– brought the car back to life with a massive infusion of front-end parts and wrenching time. Once his Nissan was healed, competition beckoned. Dustin put in a roll bar and took the car to a club time trial at Charlotte Motor Speedway. He had so much fun he brought it back and installed a full cage. Then he ran the 2012 Southeast Division Time Trial Series and won the championship in the D Street Prepared class. The car remains nearly stock, with allowable modifications under class rules. And push he did, knocking 7 seconds off his personal best and setting a DSP class record with a 1:35.933. He also loves this course for another reason: Here he met his girlfriend, Jessica Hunter, also a driver and course worker. Citing their shared interests, he calls it a “match made in heaven.” Well, if not in heaven, at least on a mountain. Heikki Rinta-Koski, a mechanical engineer who lives in an Atlanta suburb, started racing in Finland more than 20 years ago, competing in everything from time trials to drag races to endurance racing. 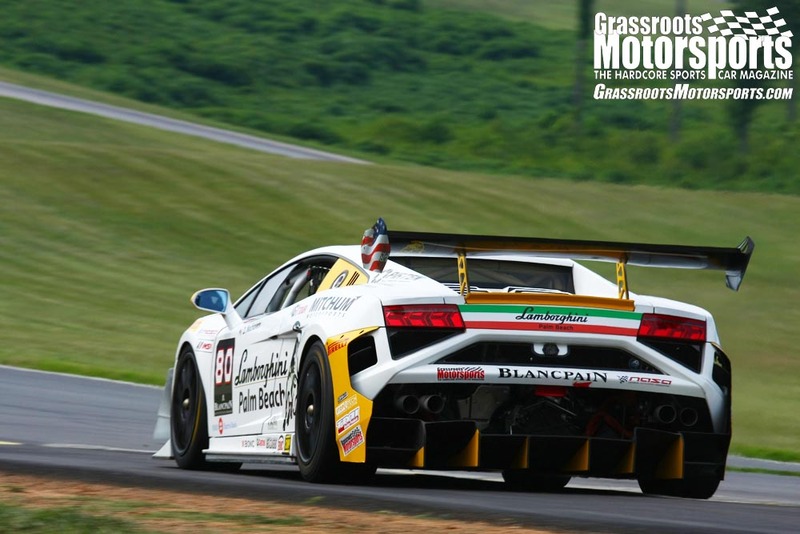 He immigrated to the U.S. in 2001, where he jumped into the fun with SCCA and NASA. 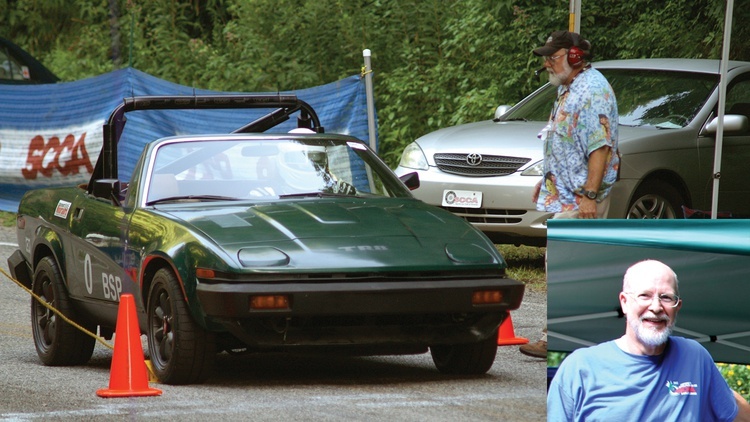 These days he drives a scaryfast, Miata-powered Locost 7 that he built himself using a wrecked Miata as a donor. This creation, pumped up with a Garrett 2560 turbo and managed by a Mega- Squirt MS3X, puts out 332 rearwheel horsepower and weighs only 1500 pounds–even with 13x10-inch wheels, an oversized cage, welded steel floors, side protection and driveshaft loops. Heikki had been developing this car since 2005, so little remains untouched. 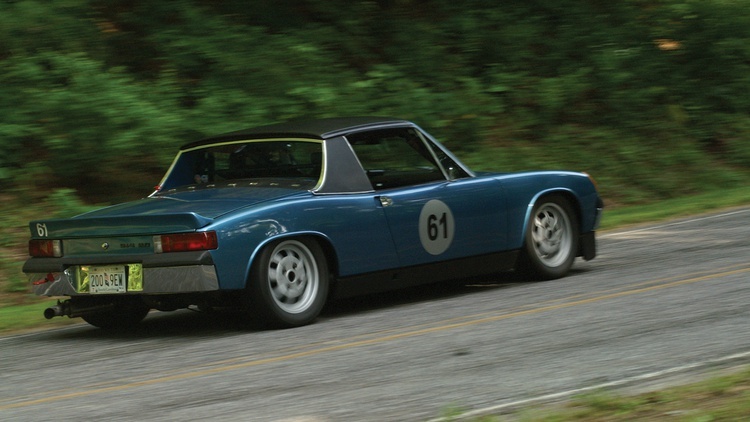 In SCCA hillclimbs, the car is classed in Super Production over 2 Liters. “I built the car for road racing,” he says, “but it does everything okay, and it’s been pretty much everywhere one can compete on asphalt.” Does okay? This car has run the quarter-mile in 11.8 seconds at 114 mph and posted a 1:32 around Road Atlanta–lapping the famed Georgia track about 10 seconds quicker than a Spec Miata. Of the six hillclimbs he’s run, he has won Kukkulan Herra (that’s King of the Hill in Finnish) four times, including at Dragon V. On this weekend, he made nine runs up the hill and came away with the fastest time: 1:15.091, which is only three-tenths off the course record, set by a Porsche GT3 Cup car in 2011. 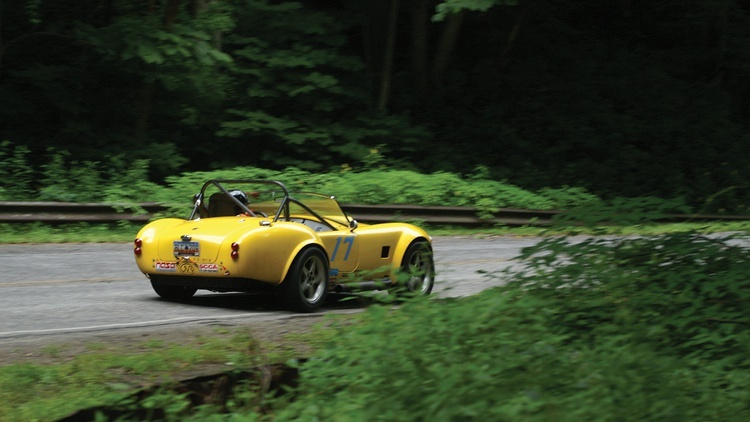 License: In SCCA, hillclimbs represent the fourth and top level of the Time Trials program. To climb the Dragon as a first-timer, you’ll need a Novice TT License and will be required to attend a classroom session before the event. 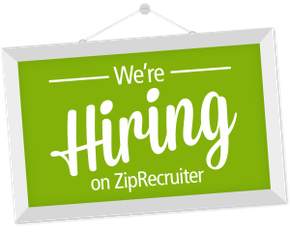 You’ll also work with a mentor. 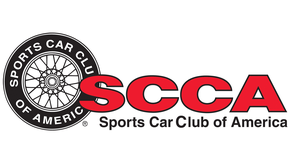 For details, see the SCCA’s Southeast Division Time Trial website, sedivtt.com. Car Preparation: Many firsttimers start in the Street Prepared class, which requires a legal roll bar (with a diagonal and harness bar), a racing seat harness and a fire extinguisher. For details, see sedivtt. com as well. Personal Safety Gear: A full complement of approved safety gear is required, including helmet, fire-resistant suit, gloves, fireresistant socks and leather foot covering, and arm restraints or a window net. The CCR’s Second Gear Program loans gear to drivers starting out–free of charge. Getting Started: Ted Theodore suggests first attending a hillclimb as a spectator, crewmember or course worker. You’ll learn the ropes and be better prepared to return as a competitor. The New England Hill climb assoc. 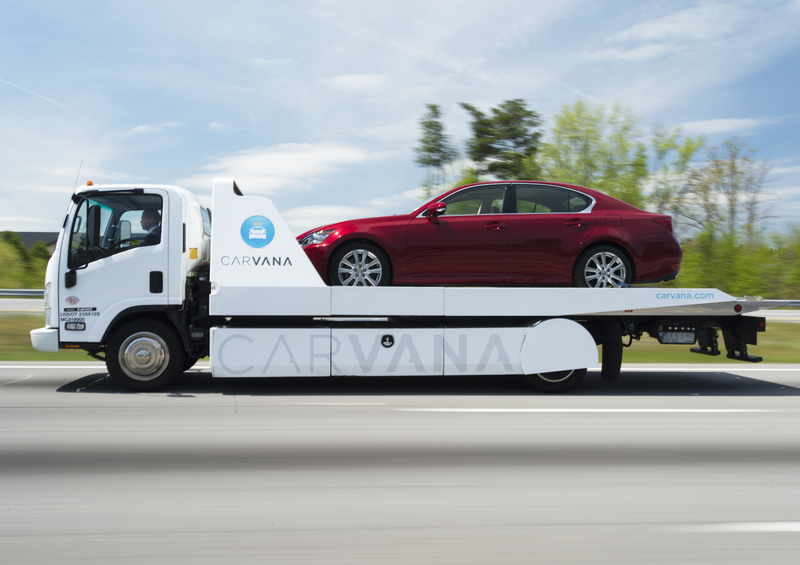 Is less restrictive for street driven cars. You can drive your car to the hill and run. They do have a rather odd classification system. Potential racers need to think of this as a single rally stage run several times. There are lots of things to hit that won't move. I would love to do hillclimbs again. I started off hillclimbing in the UK where you could driver your road car (Opel Manta GTE), but over here in Michigan there haven't been any hillclimbs for most of the time I've been here. There is now the Empire Hillclimb that's been sanctioned by both NASA and now SCCA, but you need a full cage to run that. Last year, I got the chance to hillclimb through an amazing program with the PA Hillclimb Assoc and long-time racer Mike Ancas. They provided the car, gear and entry fees. It was a bucket-list item for sure and as soon as I can, I want to get a car and go climbing! First you have to find a hill. Would absolutely love to do a hillclimb someday. Have been enjoying mountain and canyon driving for years, but a closed off event? Heck yeah! Hmm, Pikes Peak is only about 7 hours away... Goal for when I can confidently say that the Supra is absolutely sorted. we have some awesome hills in western ny ,but the ny attitude is nothing is done that is fun or does not give the politicians money and pay insurance companies a fortune .So no one does much with moving events here .darn blue state funsuckers . Their idea of risk management is go do it somewhere else where we can't ever get sued or called out for dangerous activities . I've always thought the road from The Village up to Main Lodge at Mammoth Mountain (CA) would make for an awesome hill climb venue. Always have to temper my enthusiasm when driving the family Expedition (loaded with family) up the hill for a ski day. pike's pike is basically invite only to enter (as is mt. washington) pretty much have to have results from other hillclimbs, stage rallies etc. in order to get your application accepted. That doesn't surprise me, and answers the question that's always been in my mind of "why don't more people do this?" so thanks for crushing my dreams man... nah, just kidding. I think it'd be fun to just attend someday. I will drive to the peak, perhaps not on race day (if it happens, it happens, but I'm not holding my breath waiting for that invite...), but I'll see the top someday. Now, another question... why don't they do downhill racing at all? My Miata is so much more fun when gravity is helping! I was told there is a law on the NY books that prohibits racing on public roads, even if closed down for an event. This is why you never see stage rallies in NY but they have them just across the border in PA.
Umm, there are several stage rallies in NY State. Brakes have come a long way over the years but can you imagine the carnage of a downhill race? British Columbia ofcourse has the Knox hill climb in Kelowna that’s been going for ever. For that event you need a full road race or rally license if I’m not mistaken. Absolutely can, it's a balance of tire wear, brake cooling, and bravado. Like I said, this is sort of my hobby, so I have a bit of experience with it. I generally run on the conservative side though, since traction loss easily could be catastrophic. When I was younger though? Wonder I'm alive to tell the tale! Hillclimbs are fun and you can win or lose by fractions of a second. Took my road racing TVR in a couple here in BC as I happened to have a 5.13 diff hanging around - top speed of a bout 90 mph but you sure got there quickly. Knew a guy that used to run Pike's Peak - said he preferred it before they paved it and also thought it was safer then. Knew a guy that used to run Pike's Peak - said he preferred it before they paved it and also thought it was safer then. Have been watching times fall at PPIHC for the last few years now, and it's like Nurburgring times in my book, mind boggling how fast modern cars have become! Pikes Peak times have dropped astronomically since paving started. I'm glad Monster Tajima was able to crack 10 minutes when there was still a little bit of gravel left. PPIHC is a whole different world, every petrol-head should come see it at least once. The best viewing is up at Devils' Playground above treeline, but you have to get there early and do your cardio and acclimatization for the best experience.